When I arrived to Quebec City over 40 years ago, I was stunned by the beautiful blue spring lawns seen in some older parts of the city. The blue flowers were Siberian squills (Scilla siberica) and they grew there by the thousands, mixed right in with the grasses. This was all the more surprising in that other lawns of the same neighborhoods were still in their dull brown early spring phase, that of a totally dormant lawn. Then, after the squills finish blooming, their flowers and leaves simply fade away, just as the grass begins to turn green. So the blue lawn turns into a regular green lawn and remains so for the rest of the season! I promised myself that if ever I owned a lawn one day, I was going to stuff it with small spring flowers… and that’s exactly what I did. Every spring, when the snow melts, my little lawn turn into a flowery meadow. And not only in blue, but also yellow, pink and white. Note that not all these early bulbs bloom at the same time, instead there are waves of color: the same location can go from yellow to white to blue over the some 6 to 9 weeks that this early flowering lasts. It’s absolutely magical and it is, in fact, the only reason I continue to have a lawn at all. You see, I feel lawns require a lot more maintenance than a laid-back gardener like myself really wants to put into them. So I eliminated the lawn everywhere on my property, replacing it with more self-maintaining plantations like shrubs and no-care perennials. But I’ve kept just one section of lawn: my little flowering meadow where the bulbs appear each spring. True enough, it still requires maintenance, but not as much as neighbors’ lawns, because I sowed a low maintenance lawn mix. As a result, I only need to mow a few times a year, plus I leave the grass clippings in place, so I never need to fertilizer. Therefore I can therefore consider my flower meadow to be still pretty low maintenance. 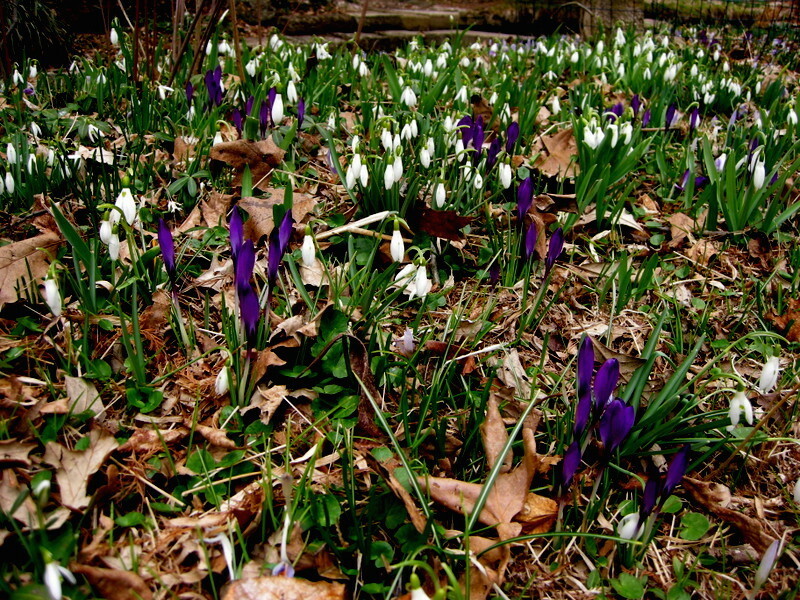 Naturalizing bulbs in a lawn is surprisingly easy. Simply cut a cut out a chunk of turf on three sides, then flip it over on the fourth side, as in the picture. This will give you a planting hole just about exactly the right depth for your bulbs. I actually just toss the bulbs into the hole and space them approximately with the tip of my shovel, but if you want to be precise, you’re supposed to space them about 3 times the width of the bulb and turn them right side up (with the point facing upwards). You can plant pure patches of bulbs, one sort per planting hole, but I like to mix mine, making sure to include extra-early, early and mid-season bulbs in the same spot for a longer show. 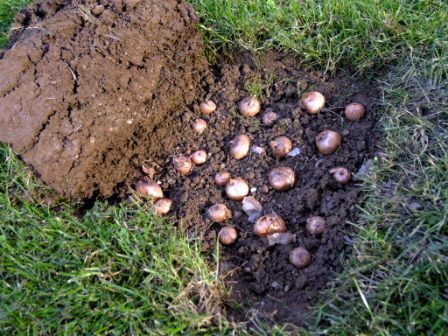 When you’ve finished placing your bulbs, drop the turf back into place, push down on it with your foot and water well. The following spring the bulbs will grow right up through the turf as if it weren’t there. Actually, naturalized bulbs requite no maintenance. The term “naturalize” means “recreate a natural state.” You plant the bulbs and you let them go through their natural cycle, that’s all. They emerge in spring with leaves and blooms, then disappear underground as soon as the grass starts to turn green, that’s all. Most bulbs will in fact multiply in the lawn over time, by self-seeding or division. 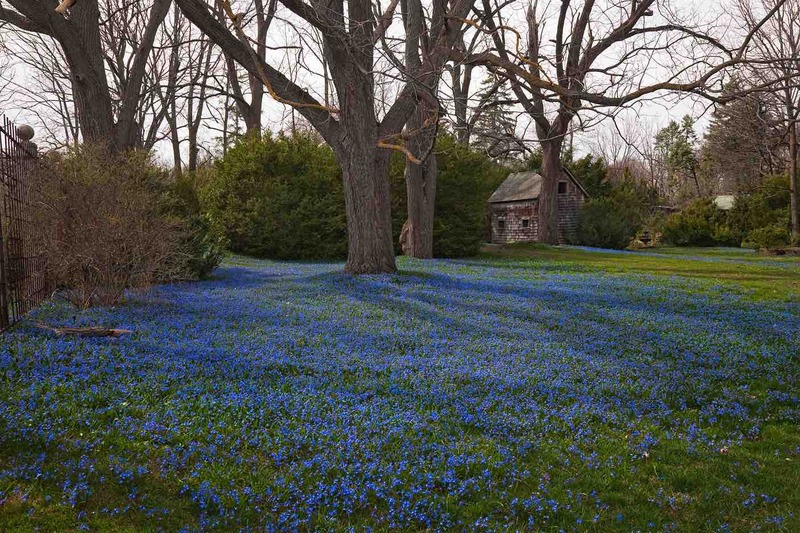 I’m sure the vast blue squill lawns I still see in old Quebec City neighborhoods probably all started with only a few dozen bulbs that since spread on their own. Crocus tomassinianus spreads readlly when planted in a lawn. My first experience with naturalizing bulbs in a lawn occurred when I was 10 years old. Having read a text on naturalizating bulbs in a one of my father’s garden catalogs, I was eager to try it, so with his permission, I planted a bag of 10 Crocus tommasinianus corms in a single spot in the vast lawn. I was pleased to death when the bulbs came up and bloomed the following spring and over the years they began to spread. Well, that was there more than 50 years ago. My brother, who now owns the house, assures me that there are now thousands of flowers every spring and that almost one third of the lawn now turns purple in the spring! All from 10 original bulbs: isn’t nature wonderful? Which Bulbs to Naturalize in a Lawn? You can theoretically naturalize any hardy spring or fall flowering bulb in a lawn, but early spring bloomers are best, because they don’t interfere with lawn mowing: they are gone or nearly so (they don’t mind having the tips of their leaves clipped) by the time you need to mow your lawn. Mascara look great in a lawn, but you’ll have to mow around them. Mid-season and late-season bulbs, though, cause a problem. 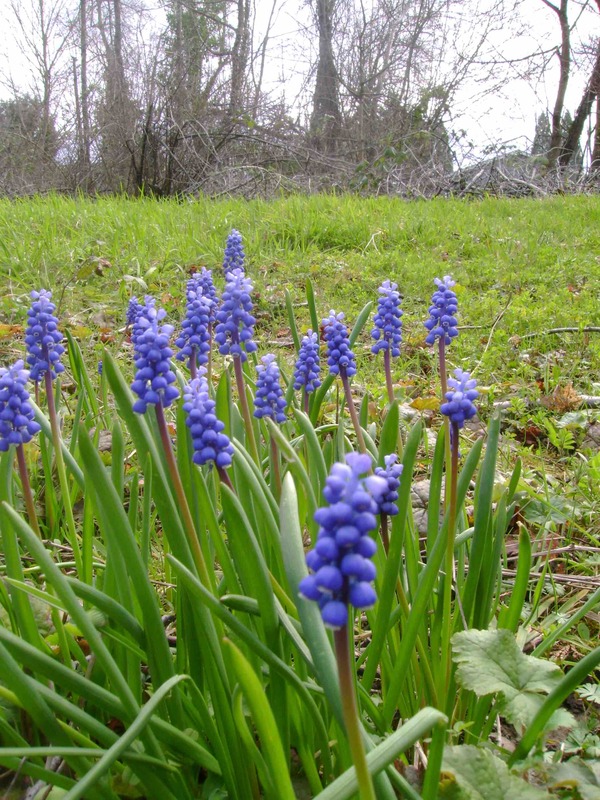 If you plant bulbs that bloom just a bit later in the season, such as grape hyacinths (Muscari spp.) or most narcissi (Narcissus spp. ), they will be in full bloom just when the grass needs its first mowing. Okay, the grape hyacinths and narcissi in a lawn are beautiful and you can simply mow around them, but that’s an extra effort. I prefer to naturalize later-blooming bulbs like these in a forest or a flowerbed, where the mower never goes, so there is no need to skirt around them and where their foliage can mature without interference. So from my point of view, the grape hyacinths are not good bulbs for naturalization, at least in a lawn, nor are midseason or late narcissi. However, the earliest narcissi, such as ‘February Gold’, do make good bulbs for naturalizing. *In very heavy soils (dense clay), crocuses are often not very perennial and will disappear over time. You’ll have to replenish the planting with new bulbs occasionally. 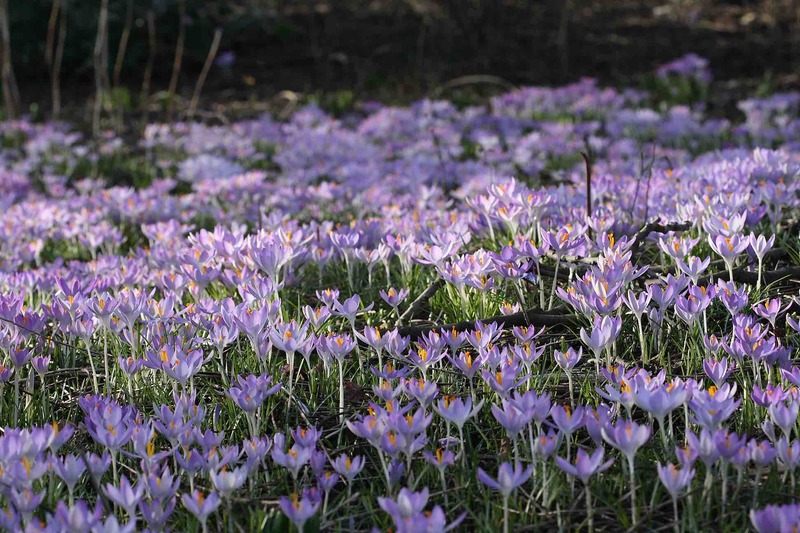 In a well-drained soil, however, the crocuses are just as persistent as any other bulb. I’m getting nervous. After reading your post about naturalizing bulbs in the lawn, I ordered 200 Scilla. Now I’ve been reading about how invasive they are. They were ordered with the intention of putting them into a small lawn area that is surrounded on all sides by my garden. I want the bulbs to stay in the lawn! Am I right to be worried? I also read somewhere else that they were sterile….they would increase by bulb but not by seed. I haven’t received them yet and as to hardiness, I live in central,lower MI. Set me straight. Please. First, no, the Siberian squill is not sterile and it does reproduce by seed. And it’s the “perfect lawn people”, the ones who only want grass and nothing else, who consider it a weed, as the leaves look like grass and it’s hard to pull this bulb out of a lawn. If it sows into a garden, though, it’s a totally different situation. Just chop off any leaves with a hoe in spring and it is gone. And it won’t even sow into a mulched border. 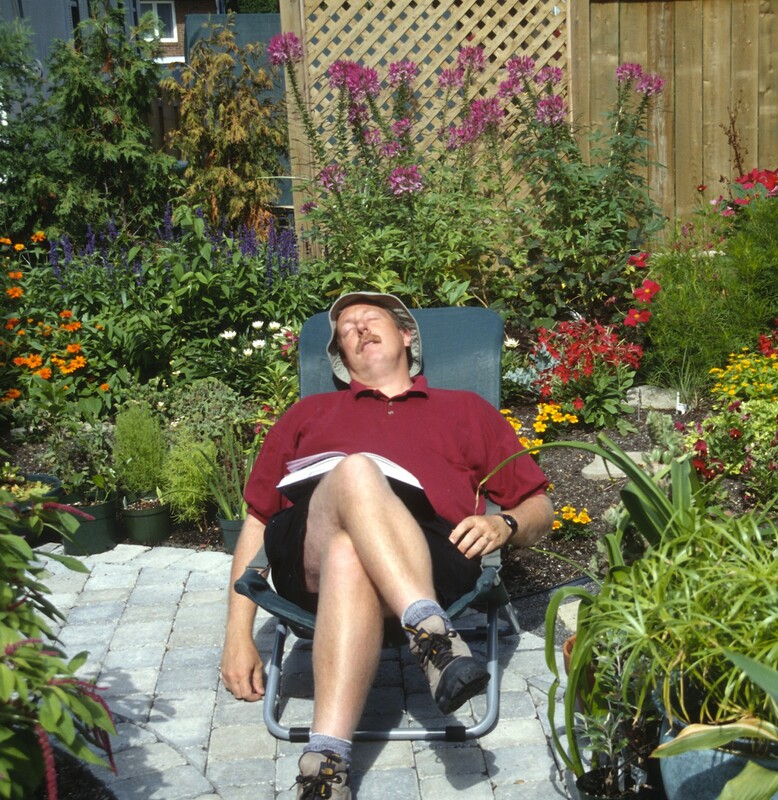 Finally, it totally disappears after blooming (goes summer dormant) and blooms before almost any garden plant, so few gardeners consider it a weed even when it ends up on flower beds. Again, it’s a “lawn people vs garden people” thing: two very attitudes towards plants. It’s hard to give a specific order, as conditions vary and plants grow faster and slower according to the conditions they run into. Even in your conditions, the order will vary somewhat from year to year. Plus, there are many species of crocus: some really early (even winter-blooming in some climates!) while others are so of mid-spring. There are many varieties of squills too and literally hundreds of narcissi, from very early to very late.